Corporations spend millions every year to engage their staff in various team building initiatives. Often times, these come in the form of lavish trips to different parts of the world. What if we told you that through Live it up, conscious traveler, we can plan a team building trip for your organization that will not only meet your objectives but it will also help impact the lives of others in a positive and lasting way at the same time? Ask yourself how you or your company’s resources benefit the community or better the life of someone else, on your next business trip? We challenge companies to utilize their resources, people and the company’s Corporate Social Responsibility to create CSR days/trips. Adding philanthropic projects to team building activities will not only help provide the community with much needed support on dynamic inspiring community led initiatives but CSR can strengthen international relations, build relationships with clients, colleagues and strengthen company moral & spirit. 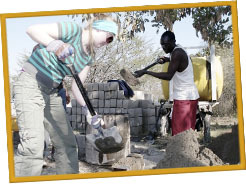 If you are a private or public sector organization who is interested in planning a team building trip for your staff, then we highly recommend a ‘volunteering’ trip that will immerse your staff in a life transforming way as they work together to help transform the lives of communities who greatly need your help. As a developing country, Uganda has many opportunities for growth and development and your time and recourses can help in making a lasting impact on the lives of many. Depending on your team building objectives and the skills in which your staff have to offer, we are happy to customize a team building volunteer trip that will best utilize your staff’s time and recourses to help maximize impact for those whom you will be helping. We are confident that this will be the best team building initiative you will ever undertake! Please email us your request on getinvolved@liveitup.org and we will get in touch with you to plan a team building volunteer trip that will best meet your organization’s requirements.